It has so many usages and because its water based it can be diluted to go much further. Citrus Bling is an incredible product that no serious valeter or enthusiast should be without! Citrus Bling is definitely our most versatile product. We often get comments from new customers of Citrus Bling that they don&apos;t know how they ran their business without it. It has so many usages and because its water based it can be diluted to go much further. In short, great value for money. Citrus Bling is an incredible product that no serious valeter or enthusiast should be without! Fast wax - As a fast wax the product is either used neat or diluted 1:1. It is a simple process of spray and wipe. It delivers an exceptional shine with very little effort and will last about 3 weeks. A car can be &apos;Citrus Blinged&apos; (Citrus Bling does not contain wax) in a matter of minutes delivering that &apos;just waxed&apos; look on both new and good quality paint work. Drying aid - Some of our customers have informed us that they use Citrus Bling as a drying aid diluted 1:3. After a quick spray on a panel and wipe down with a drying towel, Citrus Bling will speed up the drying process and also add gloss to the paint work, giving an impressive finish to just a wash.
Quick detailer - Citrus Bling is used in showrooms to quickly remove dust and add extra gloss to the showroom cars quickly and easily. it can be diluted 1:3 and up to 1:8 which gives exceptional value. 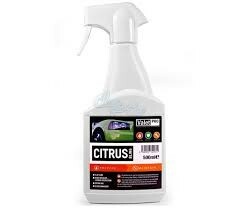 5 litres of Citrus Bling will make 20L to 45L of quick detailer making it the best value quick detailer on the market. Used regularly as a quick detailer, it will help reduce dust and dirt building up on your car. Glass cleaner - This is either a love or hate purpose for Citrus Bling. Some customers believe it&apos;s the best glass cleaner on the market while others don&apos;t. We think this is all down to your personal method of glass cleaning. In truth it&apos;s an optional use but not for everyone. Clay lube - This is definitely an area where Citrus Bling excels. Diluting 1:16, parts water, five litres of it will make 85L of clay lube and just one 500ml bottle will make 8.5L. Truly exceptional value for money. One of the most important jobs for a clay lube is to create a barrier thick enough to protect the paint work but thin enough to allow the grime and contaminate to be picked up by the clay and Citrus Bling does this exceptionally well, but it will also add gloss to the paint work while doing so. This also helps to add shine in the long run when a wax is applied. Paint cleanse and gloss enhancer - Citrus Bling contains orange peel derivatives that help clean the paint surface when used neat. This process removes tar, tree sap and other contaminates. It can be used with a duel action polisher, panel by panel, making sure you wipe up with a good quality microfibre afterwards. This process gives the paintwork extra gloss prior to wax application. If you&apos;re looking for a paint cleanse with no abrasives then look no further. Citrus Bling will knock your socks off! Multi- purpose - Used neat or diluted 1:1 you can clean and protect wheels and door shuts with ease. It is also exceptionally good for cleaning and protecting VDU (use a soft microfibre cloth).